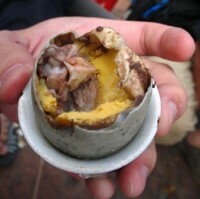 Balut is a fertilized duck embryo that is boiled alive and is eaten in its shell. It is a high-protein snack often seen in the Southeast Asian region but it is common sold as a street food in the Philippines. 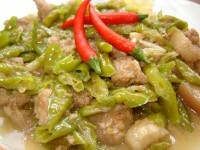 Bicol Express is a popular Filipino stew characterized by its spicy taste. The dish is said to have evolved from another dish in the Bicol region, who has been known for their spicy cuisine, but Bicol Express is actually developed by a restaurant in Malate, Manila. Tinola is a soup dish that is made out of chicken, green papaya, chili leaves, pepper, and ginger. It is a simple dish that is a favorite of many Filipinos. Tinola can be served as an appetizer or as a main dish that is paired with steaming white rice. Bistek Tagalog is the Filipino version of beef steak. 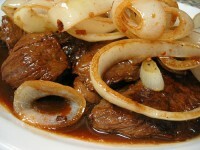 It is a usual Filipino dish made out of pork or beef marinated in calamansi or lemon juice, soy sauce, pepper, then topped with ringed slices of onions. 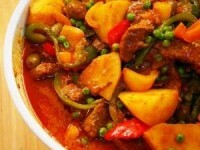 Caldereta is a comforting beef stew popular in the Philippines. Every family has its own version. 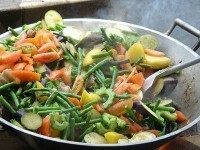 Experiment with the ingredients and try different vegetables. The original recipe was adapted from the Spaniards during the occupation of the Philippines. 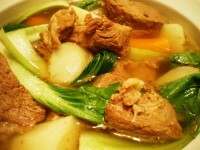 Beef Nilaga or Nilagang Baka is literally translated as “Boiled Beef“. This is a simple soup dish best served during rainy and cold weather. The key to a delicious Nilagang Baka is a flavorful broth and tender beef. It is best served hot with a side of white rice. Sisig is a dish that originated in Pampanga. It is made from pig's head that is boiled, chopped, grilled, and fried. It is a popular appetizer or main dish. 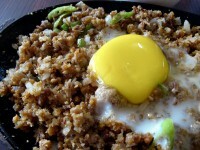 There are also variations of sisig such as chicken sisig, tuna sisig, milkfish sisig, and more. 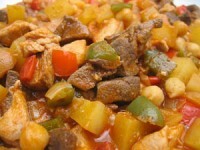 Menudo is a traditional stew from the Philippines. Although the dish has a Mexican dish of the same name, it differs from the meat that is used which is sliced pork and calves’ liver. It is a tomato-based stew that has several vegetables added for extra flavor. Kare-kare is a Philippine stew with vegetables and meat. It is thickened through the use of grounded peanuts or in some cases peanut butter. It is partnered with shrimp paste or bagoong and served with rice.